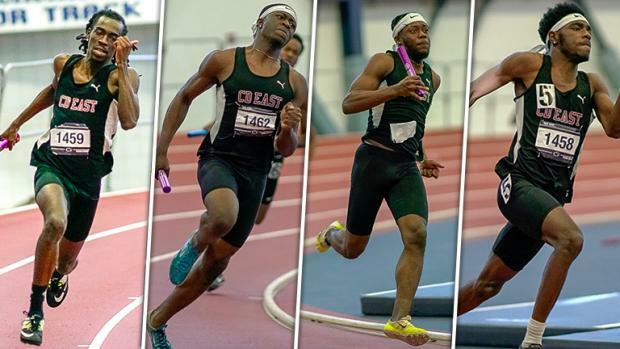 Right before the holidays, the Central Dauphin East boys dropped a solid PA#1 and US#8 time in the 4x200-meter relay, running 1:31.30. But that came on a flat track at Franklin & Marshall. So needless to say the Panthers were anxious to get on the banks and see what it could do on a faster track. CD East didn't disappoint. The Panthers dropped a US#2 time of 1:29.02 at Saturday's Kevin Dare Invitational at Penn State, the same track that will play host to the PTFCA Indoor State Championships in late February. The quartet of Stephon Brown, David Niang, Emmanuel Niang, and Shawn Brown handed off in first at the initial exchange and were clean all the way throughout en route to a dominant win. Only Bullis, the sprint factory from Maryland, has a faster time in the country so far this season. Bullis ran an incredible flat track 1:28.39 on a flat track at the Southern Maryland Classic over the weekend). CD East's time from Kevin Dare is fast for any time of the year. In fact, no Pennsylvania squad ran faster all of last season indoors. Saint Joseph's Prep, the eventual state champs in the event, ran the PA#1 time of 1:29.68 at the Armory last winter. CD East ran a season best last year of 1:30.74 at the season-capping New Balance Nationals Indoor in March. The Panthers are well ahead of schedule in 2019. With the Haverford School dropping a 1:29.66 over the weekend in New York, the 4x200 is shaping up to be one of the state's most exciting events this season.